April showers are here! Keep your kids dry and healthy with Hatley’s PVC-free raincoats for boys and girls. 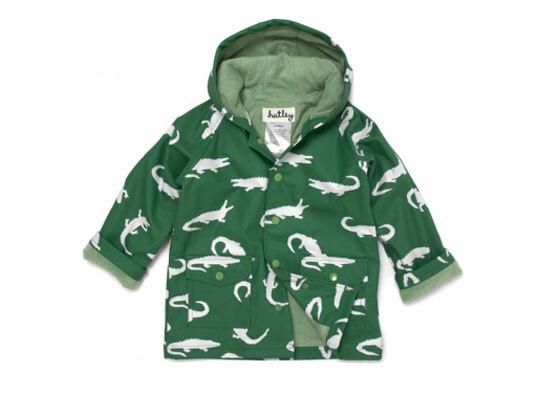 The coats feature fun graphic patterns including alligators, watermelon slices, dogs, roses and more. Although they are made from polyurethane, a synthetic plastic, this material is much safer than alternative rain slickers which are typically made of PVC or coated in toxic waterproofing chemicals. April showers are here! Keep your kids dry and healthy with Hatley's PVC-free raincoats for boys and girls. The coats feature fun graphic patterns including alligators, watermelon slices, dogs, roses and more. Although they are made from polyurethane, a synthetic plastic, this material is much safer than alternative rain slickers which are typically made of PVC or coated in toxic waterproofing chemicals.